Infuriated by Vance's strong-arm tactics and his use of war conservatives to defeat Holden, many of Holden's supporters in the army deserted and returned home after the election. By mid-August, powerful bands of deserters again roamed the central Piedmont, robbing, terrorizing, and killing loyal Confederate citizens, especially Home Guard and militia officers. 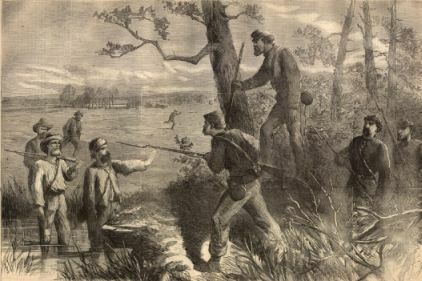 With Maj. Gen. William T. Sherman approaching from the south and Federal naval and army forces threatening Fort Fisher at the mouth of the Cape Fear River, Vance took strong measures to suppress the deserter uprising. He mobilized all of his Home Guard and militia forces in the western part of the state and ordered most of them into the disaffected counties. Skirmishes between the opposing forces resulted in the killing or wounding of numerous men on both sides. Vance ordered his troops to ignore the civil law and to arrest the wives, children, parents, and siblings of deserters and hold them captive at ad hoc prison camps in the field. The ploy worked-deserters surrendered in droves. By October, the deserter hunt was over and Vance's state forces were free to be deployed in the defense of the Cape Fear region. Holden's 1864 convention movement and gubernatorial campaign comprised his second attempt to circumvent Richmond and lead North Carolina and the South back into the Union, thereby avoiding defeat, military occupation, and emancipation. Perhaps the movement was also intended to increase peace sentiment in the North and promote the election of a Democrat to the White House in the fall. Holden's defeat in the 1864 gubernatorial election in August, as well as the military repression of his supporters in the central Piedmont that followed, delivered the death blow to the peace movement in Confederate North Carolina. "Rebel Deserters Coming Within Union Lines." Harpers Weekly, July 16, 1864. Available from Son of the South at http://www.sonofthesouth.net/leefoundation/civil-war/1864/july/deserters.htm (accessed May 15, 2012).